MELVIN VAN PEEBLES “Sings” On Geek EmaNation Podcast! 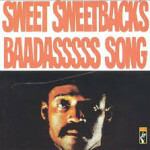 As MELVIN VAN PEEBLES put it himself, “What The F#%$@ You Mean I Can’t Sing?” Most people know about Mr. VAN PEEBLES’ amazing innovative DIY film from the early ’70s Sweet Sweetback’s Badasssss Song, but few know that he put out a plethora of intriguing and revolutionary records around the same time, sometimes under the moniker BR’ER SOUL. Hear all the righteous anger and inspired proto-rap from this undersold genius here. Take it to The Man, fellow music geeks!